New Delhi: The Department of Economics, Jamia Millia Islamia organised Mega Alumni Meet on 17th February, 2019. 60 alumni belonging to different batches from (1984 to 2018) overwhelmingly participated in the meet. More than 150 current batches of students belonging to B. A. Honours , M.A. and PhD Economics graced the occasion. through better research by faculty members particularly young faculty members. Illiyan requested all the alumni to contribute whatever way they can and be partner in the growth and development of the Department. 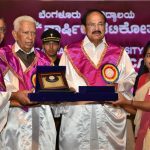 He also showcased the performance of the Department in both academic and and non academic activities in recent time. The Guest of Honour, Mr. Syed Mahmoud Nawaz , 1988 batch alumnus of the department and a renowned film maker and a journalist addressed the gathering with his enlightening speech and reminded the students about the importance of hard work for their future growth. The film produced by Syed Mahmoud Nawaz about Gorkha Rifles (Kranti Veer) were also screened in the event. Honouring Senior Most Alumni and Retired Teachers and staff were another peculiarity of the alumni meet this year. Retired professors S.A.R Bilgrami and, Professor Khan Masood Ahmed(former Vice Chancellor, KMC Arabic, Parsi and Urdu University, Lucknow)who were present in the meet were specially honoured by the organising committee. Senior most alumni award were presented to 1) Shri Kamal Akther (Former Rajya Sabha MP, Former Cabinet Minister, UP and former students union president Jamia Milla Islamia and an alumnus of the Dept 1991 batch), 2) Shri Abdul Salam Khan Advocate and formerly associate with India Islamic Cultural Centre and 1986 batch alumnus and 3) Shri Sabir Husain , Lecturer, Economics, R.P.V.V.,and 1987 batch alumnus. The event also honoured 14 M.A. Economics final year students who have cleared UGC NET and 3 students who have got campus placement. The students of M.A and B.A Economics who have won prizes at national and international levels in chess, foot ball, Debate, Speech, Quiz etc. were also honoured in the event. The rest of the event included many interaction sessions with our Alumni members and mesmerising and marvellous cultural performances (by the students of the Dept) such as group dance, singing,skit, play etc. which enthralled the audience. A video about the department produced by B.A. (Honours) Economics students were also screened. All the alumni were presented with memento by the Head of the Department. The event was wrapped up by a beautiful shayari and vote of thanks by the Vice-President of Subject Association,,Mr. Nitin Sharma.